Caresoft team members bring with them a wealth of experience in their respective fields. The firm generally works with clients that have annual revenues of $500 million or more, ranging from private enterprises to publicly listed Fortune 500 firms. "It is wonderful to have a team of Talented, Hard working and Smart people working together to make Caresoft an IT Leader! And, it is great to see our efforts being recognized by the Industry," said Deepak Khare, president and CEO of Caresoft Inc. 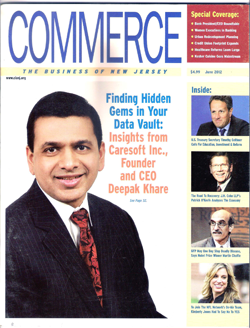 Inside the pages: Caresoft's specially trained Hyperion Team "tirelessly worked extended hours to break through the maze of the hospitality service provider's financial systems," adds Caresoft's Enterprise Performance Management Solutions Architect Amit Sanghi. "We dug deeply throughout the company to capture, centralize and automate the disparate systems into a single financial data management system that release the financial analysts from mundane spreadsheet activities and automated most of the number crunching. By freeing them from most of their report preparation reporting tasks, the analysts were able to participate with their CFO in expanding the growth frontiers of the company. Headquartered in Middlesex NJ, Caresoft is a leader in Custom Software Development, Temporary IT Staff Augmentation and Outsourced QA Services. It is known for the highest quality of IT Specialists who have a wealth of experience serving Hospitality, Telecom, Pharmaceutical, Financial and related industries throughout the world.